Dr. Goh is an endocrine specialist with a special interest in diabetes, thyroid disorders and exercise endocrinology. He studied medicine at the National University of Singapore where he was awarded the Dean’s List and graduated with a Bachelor of Medicine and Bachelor of Surgery (MBBS) in 1996. After successfully completing his advanced specialist training in Endocrinology in 2007, he was awarded the Ministry of Health Human Manpower Development Programme Scholarship to pursue further specialist training at the Aberdeen Royal Infirmary and the University of Aberdeen in Scotland where he obtained with distinction a Master of Science in Molecular Exercise Physiology. Subsequently, he was elected as a Fellow of the Academy of Medicine of Singapore and the Royal College of Physicians of Edinburgh (UK). 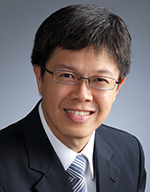 Dr Goh is dually accredited in both endocrinology and internal medicine. He also completed a Master in Medicine (Family Medicine) and inducted as a member to the College of Family Medicine, Singapore. This has enabled him to provide a high quality of personalized and holistic specialist care. As a testament to his unique skillset, he received the Service Champion Award in 2012. Dr Goh has an outstanding research portfolio and was awarded research grants from the National Medical Research Council, Endocrine Metabolic Society of Singapore and Alexandra Health. He has shared his findings and extensive clinical experience on exercise, diabetes prevention, thyroid diseases and sodium disorders through numerous publications in peer-reviewed scientific journals and books. Formerly a Senior Consultant and the first Head of Khoo Teck Puat Hospital (KTPH) Department of Medicine Unit 2 and Division of Endocrinology, he was responsible for overseeing the hospital’s endocrine subspecialty development and spearheaded key initiatives such as the thyroid service, multidisciplinary thyroid cancer protocol, inpatient diabetes protocols and diabetes exercise programme. Previously an Adjunct Assistant Professor with the Yong Loo Lin School of Medicine at NUS and a Visiting Consultant to KTPH, he currently sits on the board of the Therapeutic Use Exemption Committee of Anti-Doping Singapore, Singapore Sports Council. Dr Goh has a passion for teaching and has served in a number of principal educational positions including Associate Programme Director for the NHG-AHPL Internal Medicine Residency Programme. In recognition of his contribution, he was conferred the Teaching Excellence Award in 2014.